Last post, we looked at a big batch of class cards. 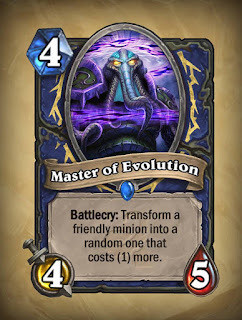 Today we're going to look at some of the remaining class cards currently on the Hearthstone Facebook page. We'll also look at some of the smaller (that is, lower mana cost) minions. Shaman is a class that is often remarked as being in need of some buffing in order to be made more consistently viable. So let's see what Whispers of the Old Gods offers Thrall, shall we? Is evolution even a thing on Azeroth? One thing all three cards have going for them, at first glance, is that they lack the oft-hindering Overload mechanic. 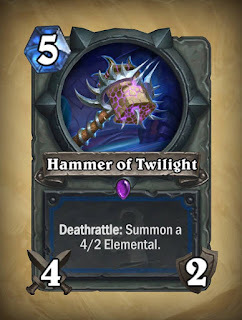 Hammer of Twilight is the weapon wielded by Cho'Gall, an ogre mage who becomes the secondary antagonist of Cataclysm. 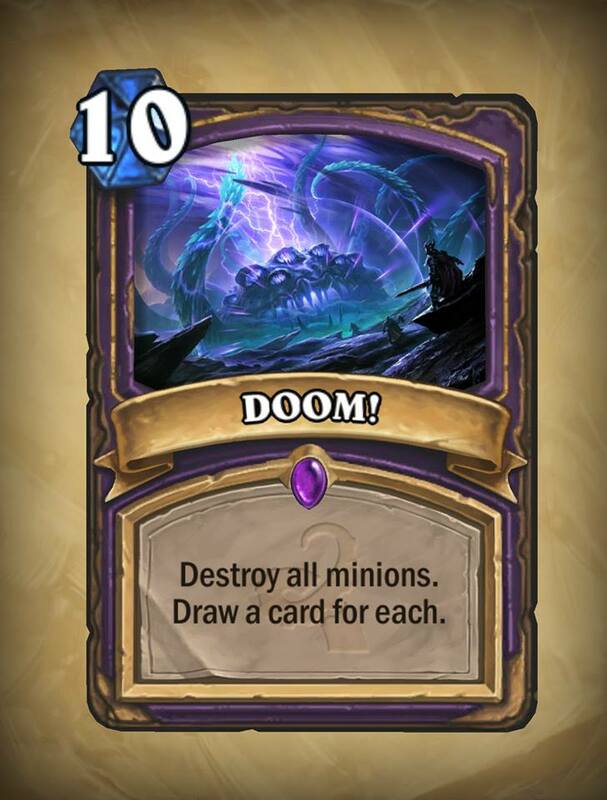 For 5 mana the weapon deals 8 damage over 2 turns and leaves behind a 4/2 minion, which is pretty good value, if not as good as, say Death's Bite. It does compete with the Doomhammer in the 5-mana spot, and is even the same rarity. All that is to say that this is a pretty good card in and of itself, but whether it fits in with Shaman decks given they already have Doomhammer remains to be seen. It must be said that the Hammer of Twilight does more damage in a single swing than does Doomhammer, making it better for removal purposes. It also doesn't have Overload. Finally, having a weapon-removing effect played on Hammer of Twilight leaves a body behind and it's not an almost immediate game-losing proposition. 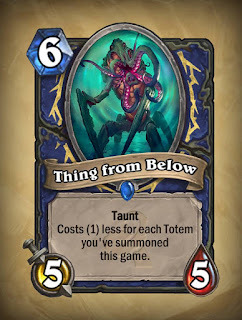 Thing from Below is probably the weakest of the new Shaman cards. All the same, it could be pretty decent in a dedicated totem deck. 5/5 Taunt for 6 mana isn't the best, but it's not shabby. If you have any Totem minions in play, though, it becomes something like a smaller version of Sea Giant. Playing a 5/5 body in the early game can often be a pretty solid tempo boost - all the more so since it doesn't have Overload. I can certainly see all of these cards seeing at least some play. 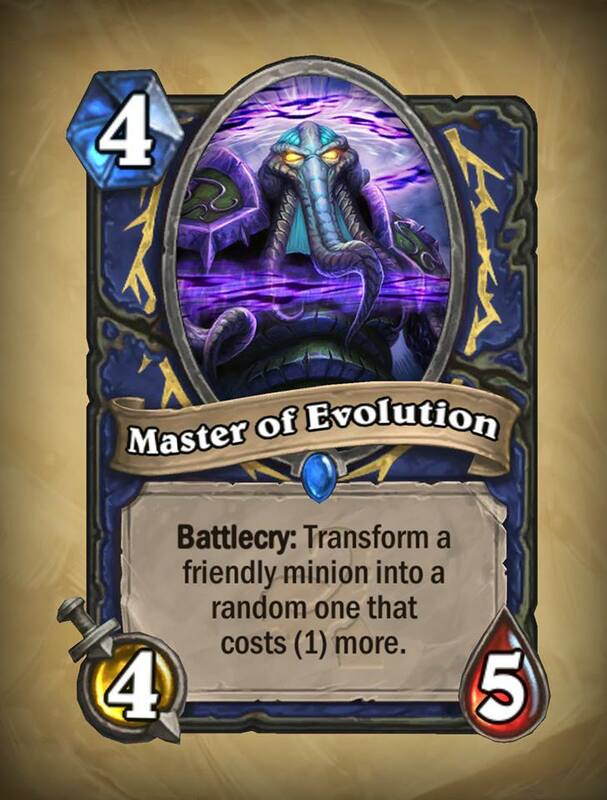 Master of Evolution will be a solid addition to shaman decks, save for aggressive ones. 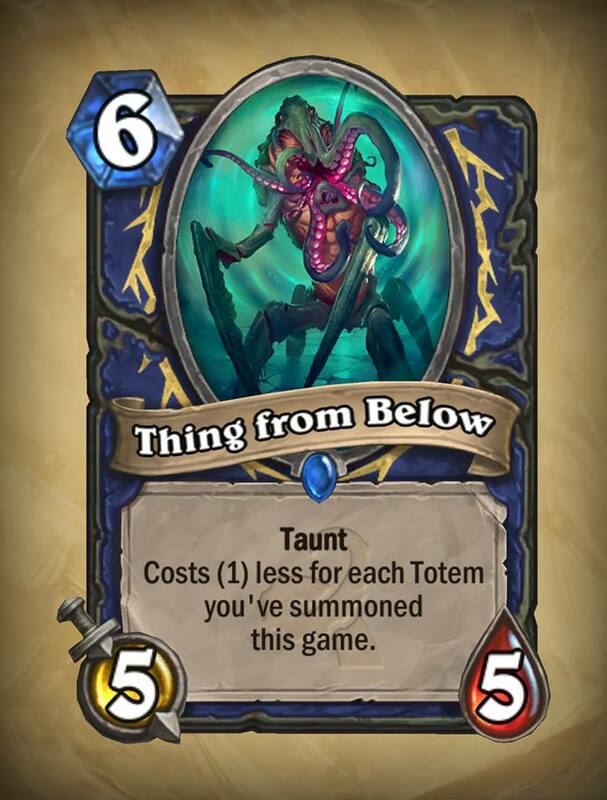 Thing from Below might work out as a 1-of in totem decks, although that will largely depend on whether totem decks increase in viability. Damn, you got madness on your pants. DOOM! This is, in effect, the replacement for Twisting Nether in Standard format. It's distinguished by costing 2 more mana and having an additional rider effect: you draw a card for each destroyed minion. It's an interesting rider, and a powerful spell. Problem is: (a) warlock doesn't really hurt for card draw, courtesy of its Hero Power, (b) if you play this on a big board you're risking overdraw, and (c) in control vs. control matches you're setting yourself up for early fatigue. Also, warlock has other board clears it can use. 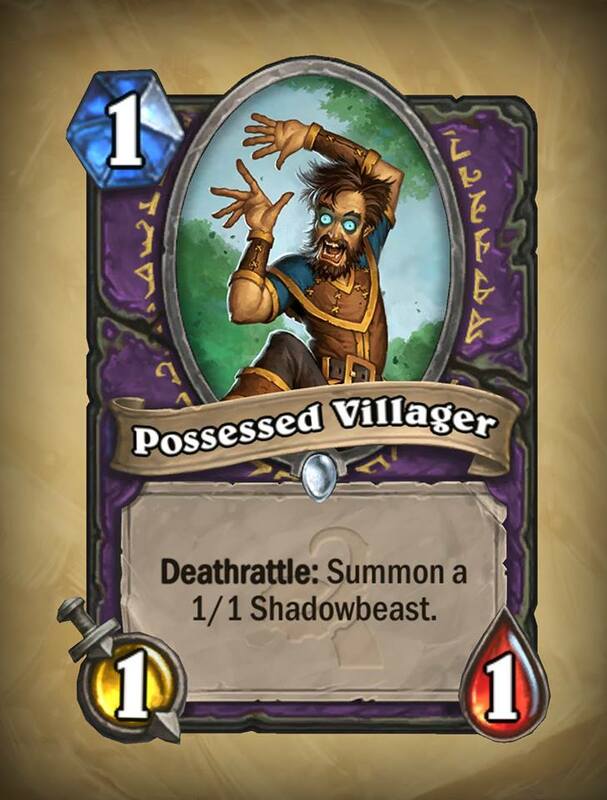 Possessed Villager is a new deathrattle minion that summons a minion upon its demise. In this case, a 1/1 that summons another 1/1. So you're getting 2/2 for 1 mana, which is pretty good - and it's sticky, so it can trade with other 1-mana minions, or injured larger minions, and end up with something still on the board. I can definitely see this having a home in aggressive warlock decks. Renounce Darkness is a very interesting spell. In effect, it represents the notion of a warlock giving up his or her dark ways. Gul'dan seems the last warlock on Azeroth willing to do this, but whatever. What makes the spell interesting, apart from its low mana cost, is that any class cards you get are discounted. What makes the spell perilous is that the class and cards are all chosen randomly. I think you'd have to run a few simulations and see it in play to really get a handle on it. Quite obviously, you'd also have to build a deck around it. 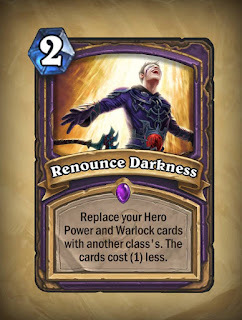 An issue I can see is that you'd need a viable deck that can win games as a warlock in case you never draw into Renounce Darkness, which may be difficult with one or two of these taking up precious spots in the deck. 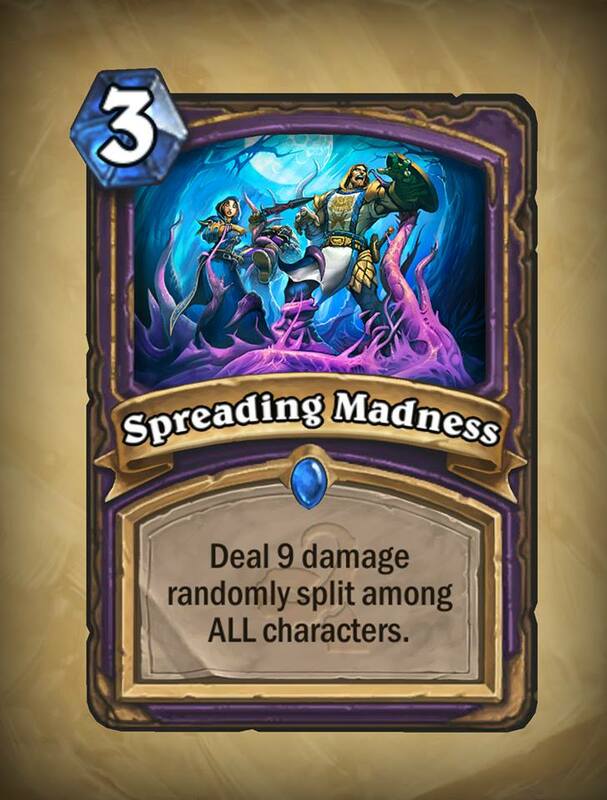 Spreading Madness is a big board clear - and a very affordable one at 3 mana. The downside is that the damage is spread randomly. You could make it work under two circumstances: if you're behind on the board, enemies are more likely to be hit than you and your minions are, and if you're running Grim Patrons, in which case damage to your Patrons floods your board. 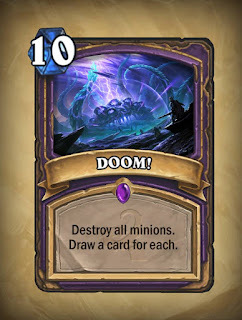 Some control-style warlock decks use Twisting Nether, but the dangers of overdraw or early fatigue are just too great, in my estimation, for them to make the switch to this card. 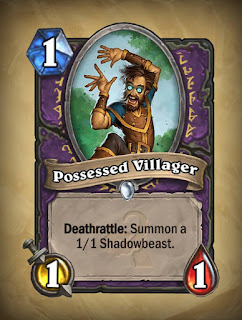 Possessed Villager will be a solid addition to some forms of zoolock. 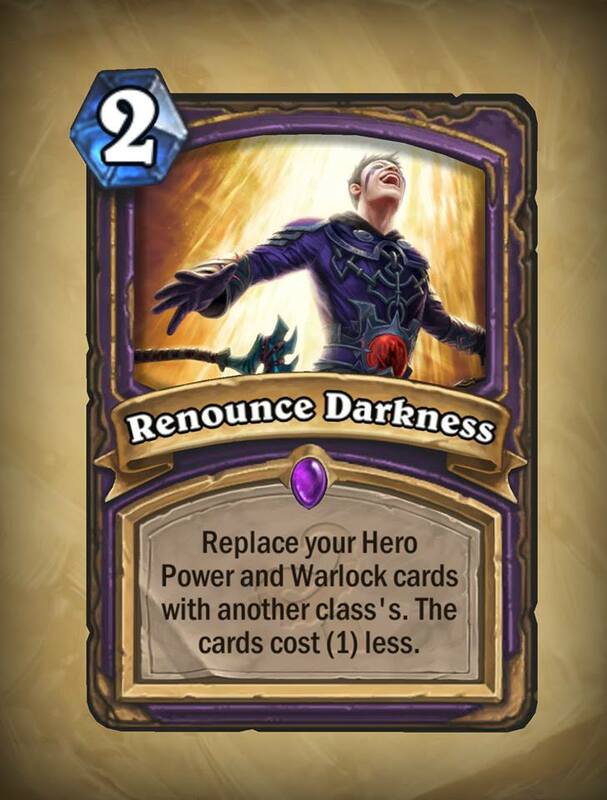 Renounce Darkness won't, I think, see much play, especially in competitive Hearthstone, but it's a very interesting card - and the potential tempo gains from discounted class cards will be valuable. Expect to see a niche deck in there somewhere. 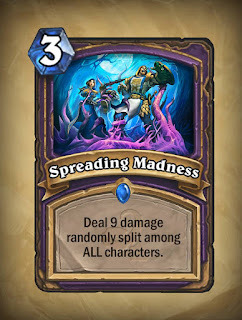 Spreading Madness might see play in a Patron warlock deck (which in fairness would also work well with Dread Infernal and Demonwrath), if one arises, where it could turn out to be quite valuable. Otherwise, warlock has enough board clear that it probably doesn't need this. OH GODS GET IT OFF ME!!!" Tentacles. Part of this complete eldritch horror. 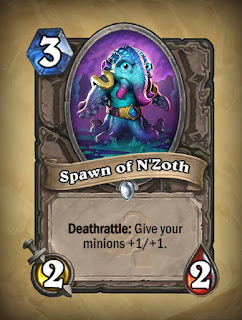 The Spawn of N'Zoth is a small (dare I say adorable?) tentacled monstrosity. It can work in a board-flood style of deck, but there's always a risk that you won't have a board to play it on, or that if you play it on curve without much of a board, it might die before you can take advantage of its deathrattle. 3 mana might be just a bit too much to pay, ultimately, for a 2/2 minion with this specific deathrattle. 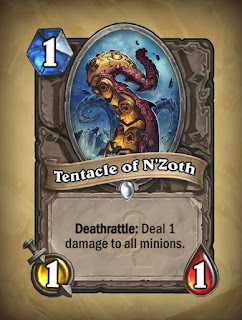 As for the Tentacle of N'Zoth is a single tentacle of the Old God itself. It's rather like a replacement for Explosive Sheep in Standard format. It can serve as another activator for, say, Grim Patrons as well as a simple board control. 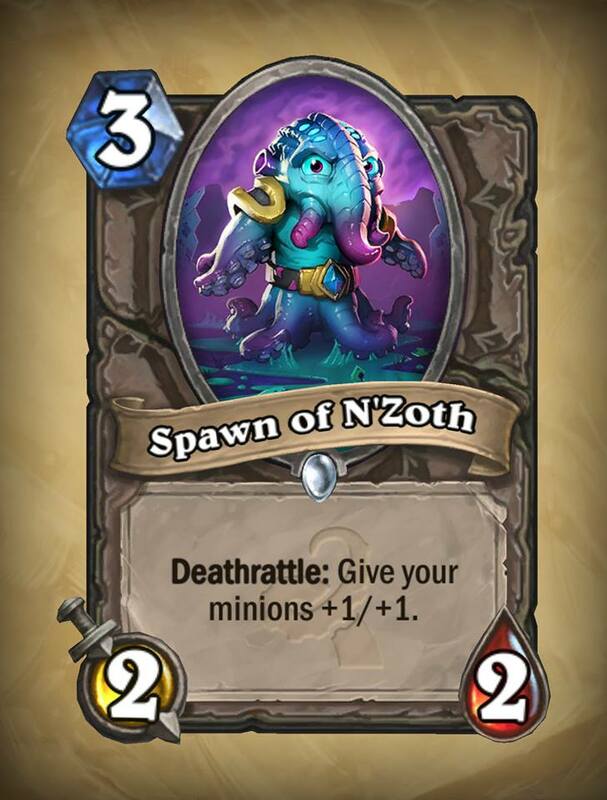 Spawn of N'Zoth might see some niche use, and when it works it will be dangerously effective. (On the other hand, if you want a "It's. Soooo. Cute!" deck theme, this plus Murloc Tinyfin are all you need.) But I suspect it is just outclassed by too many other 3-drops. 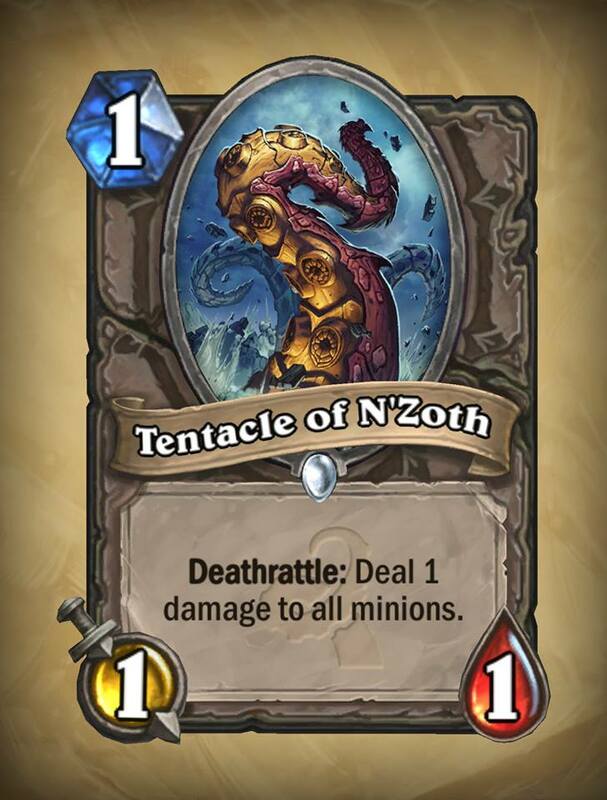 Tentacle of N'Zoth will probably fill in as an anti-aggro tech card in, say, Freeze Mage decks, and it might help enable Patrons if classes other than warrior try to run a Patron deck. That's about it, likely as not. One of the themes of the Whispers of the Old Gods expansion, as we have seen with some of the legendary cards, is the inversion, subversion, or corruption of existing cards. So here are a couple more cards following that theme. "Uhh... Fiddlebitz, what happened to you?" 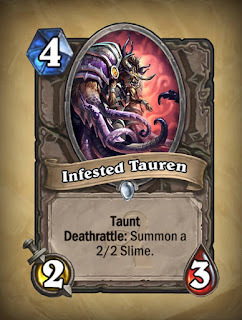 The Infested Tauren appears to be a less-powerful version of the Sludge Belcher, in addition to a variant of the Tauren Warrior. 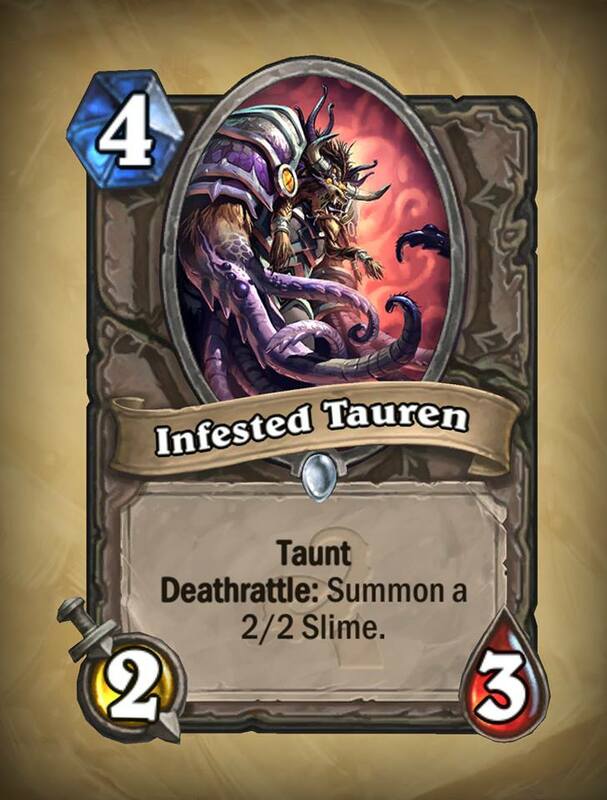 The mana cost is in between the two; the stats match that of the Tauren Warrior, and the Infested Tauren leaves a 2/2 body behind in a manner similar to the Sludge Belcher (except the leftover Slime doesn't have Taunt). 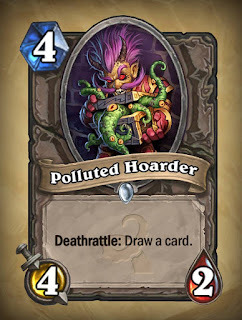 The Polluted Hoarder is a bigger (and more tentacularly-endowed) Loot Hoarder. A 4/2 for 4 mana isn't unheard of, although it's not the best stats. The big question is whether the deathrattle is enough. It has the virtue, unlike Loot Hoarder, of not being "ping-"able (that is, mages, druids, and rogues can't just kill it with their Hero Power). 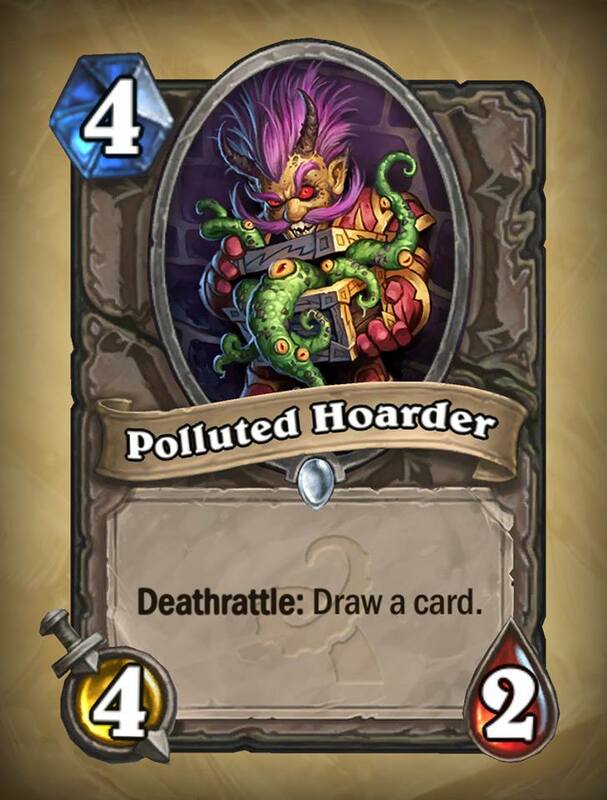 The Polluted Hoarder is probably not going to see tons of play in Constructed, because it's pretty fragile for a 4-mana minion. It's my understanding that's a different story in Arena, where the area-of-effect spells that wreck it so easily are found less often. Appropriately, Faceless creatures, or variants thereof, are appearing all over this expansion. Here are a couple of Faceless minions. I got nothin' for this caption. The Eater of Secrets is the Standard format replacement for the Kezan Mystic. Because the Kezan Mystic gives you the Secret, it's probably a better card most of the time because of the tempo swing. 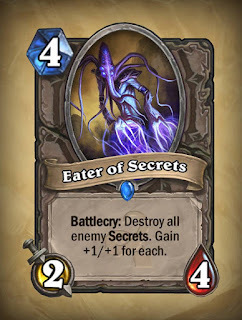 The Eater of Secrets, on the other hand, is a better play when dealing with the plethora of secrets unleashed by a Mysterious Challenger (who, it must be said, may not appear much in Standard with Avenge being rotated out). Both of them, of course, are perfectly fine if you just need to get that one Secret out of your way in order to win. 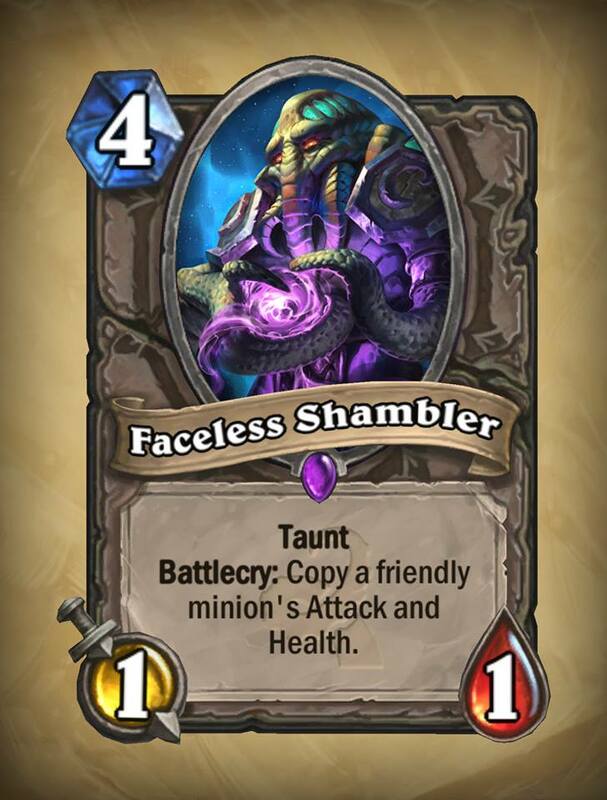 The Faceless Shambler is like a variant of the Faceless Manipulator. Both copy minions, but where the Manipulator just straight-up copies them, the Shambler copies their stats and has Taunt. While an interesting ability, I don't see that it has much potential except as a "win more" card - if you have, say, Ysera on the board at the start of your turn, you can copy her stats to have a 4/12 Taunt: a good protection for Ysera and for your face. If you have a giant on the board, you can get yourself an 8/8 with Taunt. But most decks running giants will run things like Molten Giant, which you can play at a significant discount, alongside Defender of Argus. Why would you play this? Eater of Secrets is no better than Fair in Standard, where it won't get to eat too many secrets at at time (unless Secret Paladin is still a thing). In Wild, while its ability is decent, it's outclassed by Kezan Mystic, except when playing against Secret Paladin. 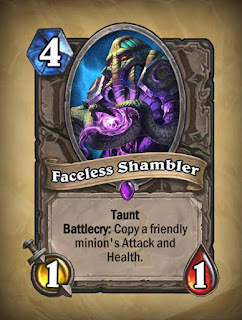 Faceless Shambler's ability is, standing on its own, decent, which is why I've rated it Fair. But it just doesn't seem to me that it will have much of a home in any major decklist. That's it for this round of reviews. It looks like I'm getting caught up with the pace of card reveals, so after the next post, I should be able to look at fewer cards at a time.